Two female slaves belonging to Mr. Wm. HEYSER, one to Mr. JOSEPH RENCH, one to Mr. HENRY K. TICE, and one male slave to Mr. JOHN BOOTH, citizens of this town and vicinity, absconded to Pennsylvania on Sunday night last They took with them a horse of Dr. E. WEIS, a horse of Mr. HENRY K. TICE, a carriage of Mf. F. J. POSEY, and a buggy of Mr. JOSEPH P. MONG. 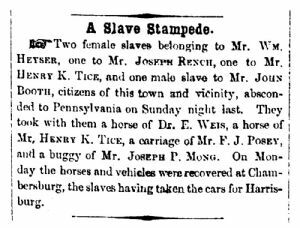 On Monday the horses and vehicles were recovered at Chambersburg, the slaves having taken the cars for Harrisburg.